“Scientific evidence permeates the law” according to Justice Stephen Breyer (see note 1). His statement was specifically about scientific evidence in a trial. However, trials are not the only place where judges are being pressed to understand and then use the ever-expanding universe of research based knowledge that is available. While present in hearings and trials, there has been a particularly strong move to have judges apply such information in sentencing and probation supervision. The development of evidence-based sentencing, a concept based on a medical model, is merely one example (see note 2). This expanding universe of scientific knowledge has engendered many discussions about the perceived need to increase the amount of science based education judges receive. Some argue that judges should be educated like scientists. The problem intrinsic this idea is that judges are specialists in the law, and generalists in everything else. Moreover, the vast majority of judges turned away from a scientific education, at least by the time they were in college and certainly by the time they were in law school. Law school teaches a different manner of seeking the truth than the scientific method. These different roles suggest there should be different educational approaches. When the judge is acting as an evidentiary gatekeeper, (for example, deciding whether the results of a drug test should be admitted in a trial) a thorough understanding of the rules on the admissibility of scientific evidence would be helpful. A judge who is sentencing a defendant and is trying to assess that person’s future behavior needs yet a different understanding — one based more on psychology and social science. How does the judicial education community meet the varied educational needs of the judiciary? It starts with the recognition that judges are specialists in the law and generalists in everything else. As part of that legal specialization judges are the evidentiary gatekeepers for any scientific or technical evidence that is admitted in a trial. As the Supreme Court stated: “Daubert‘s gatekeeping requirement is to make certain that an expert, whether basing testimony upon professional studies or personal experience, employs in the courtroom the same level of intellectual rigor that characterizes the practice of an expert in the relevant field” (see note 4). Providing judges with the tools to make better evidentiary decisions about the admissibiity of scientific evidence will also ensure that the trier of fact is not confused by poor or junk science. Gatekeeping will not help a judge better understand the emerging science about addiction when it comes to sentencing. Neither will it help with a risk assessment about a defendant’s future conduct. But, as sentencing is a part of the specialized training judges already receive, there is a wealth of training and conferences on this topic. For example, one need only look at the National Association of Drug Court Professionals annual conference for trainers who teach about every aspect of addiction and sentencing. Still, not every judge has either the time or the interest to attend a national training. How can we better assist the judiciary in dealing with this flood of scientific evidence? One answer was developed by our colleagues in Canada created a bench book entitled the “Science Manual for Canadian Judges” (see note 5). Bench books and the trainings connected to them are an excellent means for helping judges keep current with the needs of their job. NAJSE should take a leadership role in creating such a manual. Judge Brian MacKenzie is an award winning judicial educator who retired from the bench after almost twenty-seven years of service. After leaving the bench he helped to create the Justice Speakers Institute where he is now a partner and chief finical officer. He has been honored by the Foundation for the Improvement of Justice with the Paul H. Chapman medal, for significant contributions to the American Criminal Justice System and by the American Judges Association for significant contributions to judicial education. 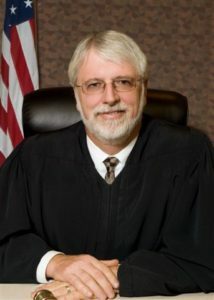 Judge MacKenzie served as the President of the American Judges Association from 2014 to 2015. From 2008 to 2010 Judge MacKenzie was the American Bar Association/National Highway Traffic Safety Administration Judicial Fellow. He received his Juris Doctorate from Wayne State University Law School in 1974. Judge MacKenzie has written and lectured throughout the world on issues including procedural fairness, veterans treatment courts, domestic violence, drug treatment courts, alcohol/drug testing, and high visibility cases. Among other entities he has presented for American University, the National Judicial College, the National Association of Drug Court Professionals, the American Judges Association, the American Bar Association, the National Traffic Safety Administration, and the National Association of Court Managers. He is the co-editor of the book, “Michigan Criminal Procedure”. He is also the author of the American Judges Association’s position paper entitled “Procedural Fairness: The Key to Drug Treatment Courts”. His blog and podcast can be found at http://justicespeakersinstitute.com/. Judge MacKenzie is married to Karen MacKenzie. He has three children; Kate, David and Breanna and five grandsons, Daniel, Raymond, Henry, Zachary and Lucas.